There are many types of concealed firearm holsters out there. Each one with features that make it one of the best concealed carry holster on the market. These great features do come at a cost and in most cases other features get sacrificed too. Sometimes it's the simple holsters that stand out. Read on to see why. Speed-Cut Design - The Speed-Cut design allows the user to draw his handgun and acquire target rapidly. It also allows you to re-holster rapidly and securely. You can also re-holster while keeping your eyes on your target. A great safety feature is that loud click you will hear upon re-holstering your handgun. This is how you will know that the handgun is properly holstered. 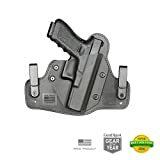 Molle Mount and Quick Disconnect System - The SERPA concealment holster also works on the Molle Mount for Military Molle Vests and leg platforms. With the Quick Disconnect System, you can seamlessly move the holster from belt loop to Molle mount to leg platform without the use of any tools. Concealment - Not as concealing as one would expect given its namesake. 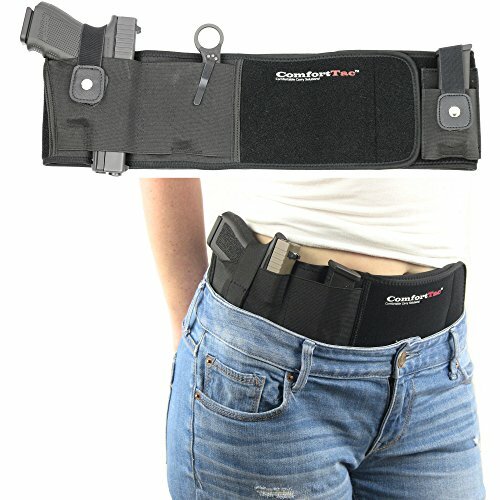 A lot of users are unable to conceal their weapons properly with this holster. It is heavy duty and bulky for some. But it should not be a problem for those who don't need to conceal their weapons. A durable and well-made product. A holster for a new generation of firearm enthusiasts. Its design will benefit beginners because of its easy learning curve. Not as concealable as one would like. But still a great product nonetheless. The one size fits all Ultimate Belly Band Holster fits around your belly or hips to provide an awesome way to conceal your handgun. Its neoprene material will allow you to stretch the band to a 46" circumference. Its elastic holster will fit most handguns ranging from large full-size pistols to small subcompact and revolver handguns. It can be worn in many different configurations like crossbody or high up like a shoulder holster under your shirt. Concealment - Because of its surgical grade elastic holster, you can adjust and place the holster in a position that suits you best. Its elastic build makes for a slim fit in any type of clothing. There is even a compartment next to the holster for items such as your cellular phone or even a spare magazine clip. Versatile - As stated above, it can be worn with all types of clothing. Many different types of handguns will fit the holster. It also supports sizes from small subcompact to Large Full-Size Pistols. The holster has velcro straps which you can use to position it the way you want. Magazine Compartment - The additional Magazine compartment or pocket is a great addition. But it is, however, loose and somewhat poorly made. This is due to a lot of users complaining that the items they put into that pocket actually fall out. The Ultimate Belly Band Holster delivers a lot in terms of concealment and comfort. It makes for a better daily experience when using a holster. However, an important feature of being able to draw your handgun rapidly is missing from this holster. But there are still a lot of people out there who are willing to overlook this. These people would rather appreciate this holster for its features and comfort. 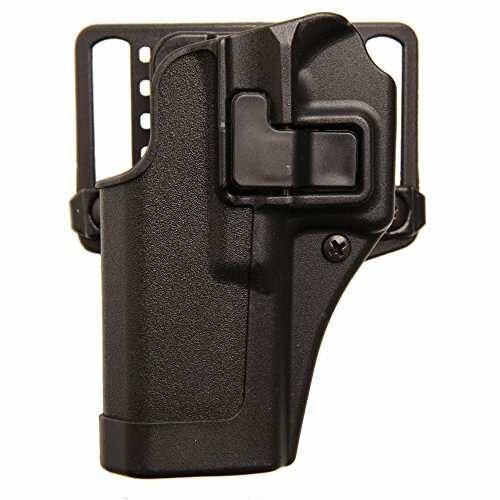 Build Quality - The high-end materials and finishing put into this holster put it at the top in terms of build quality. The side that sits on your skin is of a neoprene waterproof material which is comfortable. The leather-ish alien skin on the other side feels good, and it’s good enough to keep your pistol in place. Many Adjustments and Instructions Available - The belt clips are movable and adjustable. You can adjust each side at three different levels. This helps you to conceal the handgun deeper or to raise it higher for a faster and easier draw. You also get great instructions and a 30-day "test drive" guarantee. Difficult to Remove and Ergonomic Issues - The belt clips are very strong and durable. But these can make it very difficult to remove. Once attached, the clips remain stuck to your belt. Your handgun will be holstered at a slight angle, so when you do draw, it will be at an angle. You won't be able to make a straight upwards draw. While most won't mind, it may a cause of concern for some purists. This 3.0 version of the Cloak Tuck Holster is a testament to the amount of research and technology Alien Gear Holsters have put into this product. The Alien material, as well as the waterproof neoprene material, feels better in comparison to the previous generations. Although this holster may not be to everyone's liking, it is undoubtedly a superb, high-quality product. To take advantage of Alien Gear Holsters' newest holster technology, we recommend purchasing the Clock Tuck 3.5 IWB for your firearm. Another great Inside the Waistband holster from Concealment Express. It's sturdy, Lightweight and durable construction makes it a great choice for many who are in the market for simple holsters. It is good value for money because of its simplicity and features such as adjustable retention and cant. Its compact design makes it a great choice for those looking for a less complicated holster. Adjustable Retention - The retention allows for a slight bit of play when the handgun is holstered. You can adjust it tighter which will secure the handgun nicely but will also make it a little difficult to draw. Adjustable Cant - This is a great feature that allows you to adjust the cant to 15% so you can clip your holster at the back. Adjusting the cant back to 0% will allow you to clip the holster at the front appendix position. Daily Usage - The Concealment Express holster is ideal for everyday use. Its compact design makes it easy to remove the holster with the gun in it and place it away on your office desk or glove box. The Kydex finish will also ensure very little scratches or damage comes to your handgun after excessive usage. Adjustable Screws - The adjustable screws on the holster retention are absolutely tiny. Loosening them to the max might allow for only a small bit of thread to hold the retention together. This can cause the screw to slip out. The same goes for the cant screws. Some Users might not be happy with the belt clip. The Concealment Express Holster is as small and compact as they get. It is also very well built and ergonomic. There really isn't much to pick on here except for the adjustment screws. Although a simplistic design, you will be happy with how much value this holster will bring to your everyday life. A very convenient choice indeed. 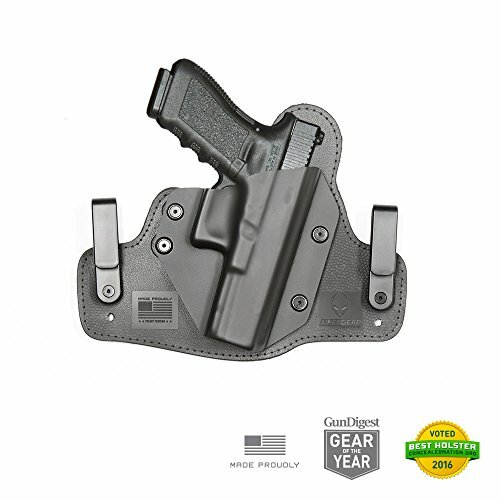 This holster is very similar to the Concealment Express Holster. It is made in the USA by a small time business who specialize in manufacturing IWB holsters. Although almost identical to the Concealment Express Kydex holsters, CYA Supply Co's holsters consist of Boltaron Thermoplastic instead. The company’s owners are war veterans who take pride in their products. They also ensure that the quality and the manufacturing process is of a high standard. Boltaron Thermoplastic - CYA Supply Co has chosen Boltaron over the more commonly used Kydex material. They claim that Boltaron is more durable than Kydex and is more resistant to chemicals and other abrasions. Boltaron also keeps it shape better under heavy heat conditions. It also supports reduced wear on the handgun and holster. Just like the Concealable Express, there is almost nothing wrong with this holster. One can say that this holster is universally popular on Amazon. There have been just a few customers who had complaints about the belt clip and the comfort of the holster. But even they rated the product well. This near perfect holster is made by people who fully understand the secret behind a good holster. Because the company behind the manufacturing of this holster is a small business, you can expect to pay less than you would for rival holsters. This is great value for money considering the quality of the product. A lot of people don't mind walking around with bulky holsters on the side of their hip. But for the rest of us, inconspicuousness is a major factor when carrying a firearm. Concealing your firearm isn't taking that same bulky hip holster and throwing your shirt over it. You will need to research and purchase a concealment holster if you wish to keep that handgun of your under wraps. A concealed holster is a much more compact holster that usually fits under your clothes. Most of them are very well made and are completely deceptive. They still maintain the same quality as most holsters and also have other modifications and adjustment features available. The downside of some is that there may not be much room for adjustment. These holsters can only be used in a certain manner like clipped to the back of your body. But these holsters do specialize in certain fields like draw speed and comfort. These Holsters are ideal for people who are only in search of those features. Below is a selection of great holsters that we analyzed thoroughly so we can see which is the best choice for you. Comfort - Holster must have a material that would be comfortable to rest against your skin. It may be fine when you wear the holster standing up, but sitting down may be a whole other story. Quality - This is one of the most important things to consider seeing that it can lead to safety issues. The quality of the holster depends on the materials that it contains. Screws loosening and coming off can cause the handgun or in some cases the entire holster to fall off. The Ultimate Belly Band Holster does seem to meet the needs of a concealment holster very well. Its Velcro strap eliminates the need to wear a belt. This is a very convenient option that allows the user to dress more comfortably in shorts or track pants. Elastic, however, can only take you so far. The high price tag is a very discouraging factor to those who may want to buy this and use as a backup holster. 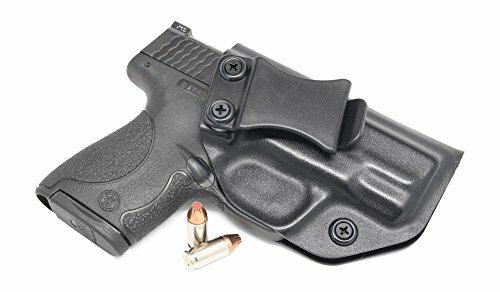 Shield 9/40 IWB Holster Veteran Owned Company is a better pick because of its all-round feature set. It's compact, durable and reliable. The cant is adjustable, so it’s easy to use in the front or back. It contains quality materials and is available at an affordable price. It will certainly meet your holster concealment needs without breaking the bank. All the holsters in this list are great for their individual needs. But excelling in a certain department usually, means having to compromise somewhere else. BLACKHAWK! SERPA CQC Concealment Holster - Matte Finish and Alien Gear Holsters Cloak Tuck 3.0 IWB Holster are fantastic products that are at the height of holster technology. They may have great designs and features, but they are not as ergonomi﻿﻿c as you would want them to be. They are also expensive in comparison to other holsters. The best concealment holsters in the list are the Concealable Express and the CYA Supply Co. holsters. They both are very similar in design and have the exact features. The CYA Supply Co. Holster is, however, made out of better materials and it’s a universally popular product. Most of these holster owners are completely happy with it. A few reasons are its great build quality, ergonomics, compact design, and comfort. All of this at a great price too!